It’s true, I’m giving up the glitter in favor of cat pee, though it may seem confusing. How could I give up something so sparkly and fun for such an odious liquid? I know, I know. These days it’s much more fashionable to declare one’s love of wine than even beer or liquor, much less cat excrement. And I do love glitter so. The smile it brings to my three year old’s face is every bit as delightful as the one she reserves for the parachute at Gymboree, except way less expensive. I’m a half hearted crafter at best. The projects I make are lopsided and pathetic. But glitter makes even my woeful creations look like something special. For some reason, though, my 17 year old son recoils as if each stray “glit” were a live hand grenade perfectly poised to detonate his dinner. And my husband rushes to his defense, proclaiming glitter just as dangerous as it is irritating. For my part, I am always extra, extra careful and clean up well. However, I’m a lousy housekeeper, so my extra efforts only mean a light dusting of glitter coating everything from countertop to light fixtures at the conclusion of each project, rather than ankle deep puddles on each flat surface. Unfortunately I have to part ways with glitter in favor of cat pee and this is why: My 20 year old’s favorite has decided that the world his his oyster. Except, substitute “litter box” for “oyster”. The world is his litter box. Yes, we’ve taken him to the vet and replaced the carpet and confined him so that he now lives in the bathroom. In fact, he was the catalyst (No pun intended. Or pun intended, whatever…) for our entire kitchen renovation. Once we pulled up and banished the living room carpet, the rest of the kitchen and living room followed. But he continues to wet the carpet and give blank looks, our anger and frustration lost on him. My husband says he can only live with cat pee OR glitter, but not both. So I’m packing the glitter up and giving it away. Goodbye glitter tutus, rolls of glitter tulle. Goodbye glitter paint. We're over! Through. Kaput. Done for. My baby girl will miss you, but my husband and son wish you “Bon Voyage! Don’t coat the door or back hall on your way out!” The vacuum cleaner and broom will thank me endlessly, although the future homeowners will probably wish it had been the other way around (Does anyone reading this need a house? It will be for sale in the spring). 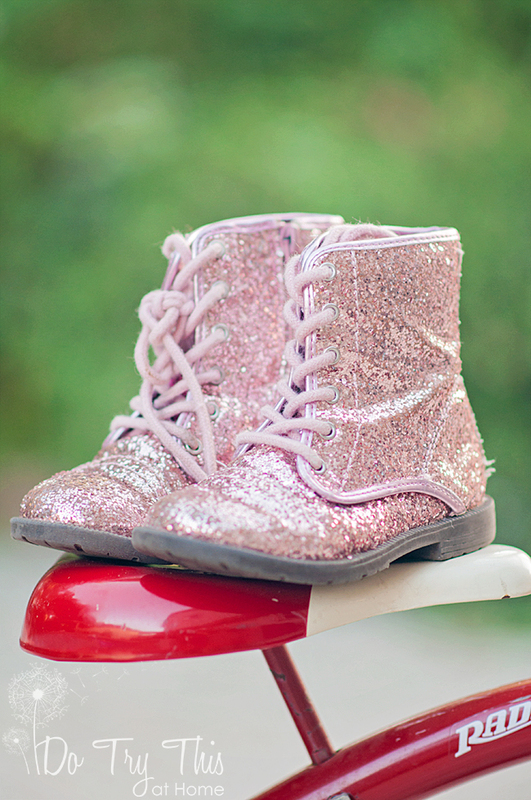 I just hope the pink glitter combat boots are still fair game. I grew up with two cats who I loved dearly but they too, ruined our house and once I got to college and would come back for visits, the odor was so bad I didn't want to come home anymore. I told my parents to put them down. I began to hate them. My parents kept them and it just continued until they finally died on their own and then my parents had to replace all the flooring and have wooden built ins stripped and redone, some furniture had to be trashed because it had absorbed from the floor (or they peed up against the legs of couches/chairs), it took forever to find every single place that had been urinated on and then for the smell to finally go away even after all that. Arizaphale, It's about a two year old problem. I think the big girl left for college, the little girl started to walk, and he decided to throw in the towel. I'll google the Cat Whisperer. I've been trying that Galaxy guy - not sure if they're one and the same.